Torquay & South Devon Summer Explorer - Featring Sidmouth and Gateway to the Jurassic Coast. Torquay, often referred to the "Queen of the English Riviera" is our base for our Summer tour that explores both South and East Devon coastline, including heritage journeys and visits exploring the very best this region has to offer. 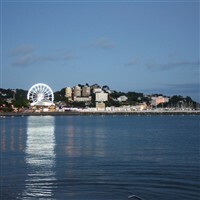 Torquay, often referred to the Queen of the English Riviera is our base for our Summer tour that explores both South and East Devon coastline, including heritage journeys and visits exploring the very best this region has to offer. Travelling into East Devon, visiting the regency coastal town of Sidmouth, then we continue along the coast to Seaton to include a ride aboard the Seaton Tramway travelling alongside the picturesque river axe through two nature reserves and giving an unrivalled view of the abundant bird life. We include a visit to the Donkey Sanctuary centre, nestled in the tranquil East Devon countryside. A free day at leisure. May be visit the neighbouring resorts of Paignton and Brixham, or Cockington, a quintessentially English village famous for its thatched cottages. Travel into the picturesque heart of Dartmoor via Newton Abbot to visit the unspoilt village of Widecombe in the Moor, surrounded by some of Dartmoor's most iconic granite tors. A trip aboard the Paignton and Dartmouth steam railway with unrivalled views across Torbay, along with the ferry crossing with free time in Dartmouth. Later we visit Totnes, a gem of a town  this ancient borough sits on a steep promontory next to the river Dart, devoting itself to arts and crafts, history, and architecture. TLH Toorak Hotel in Torquay is renowned for good food, award winning gardens, great service & outstanding leisure facilities, all within a short walk of Torquays finest beaches.